All the juicing capabilities that Waring has to offer - in one package. Heavy-duty Professional Quality Stainless Steel Bowl and Cover. Put on the Citrus Juicer Attachment, and you can make refreshing fresh-squeezed orange juice or lemonade, too. Interchangeable parts are commercial quality stainless steel and impact-resistant plastic. Detachable Parts are Dishwasher Safe For Quick and Easy Cleaning. 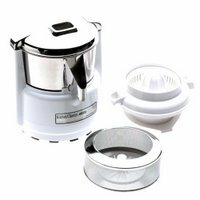 MSRP $365 Based on the Manufacturer's Suggested Retail Price, this juicer is more expensive than average and is priced in the top 10% of juicers. Premium Features 3 When compared to other juicers, this appliance has an average number of premium features. Star Rating 2.3 User reviews, ratings, and feedback indicates that this juicer is rated lower than average by 3 users and ranks in the bottom 3% of juicers.